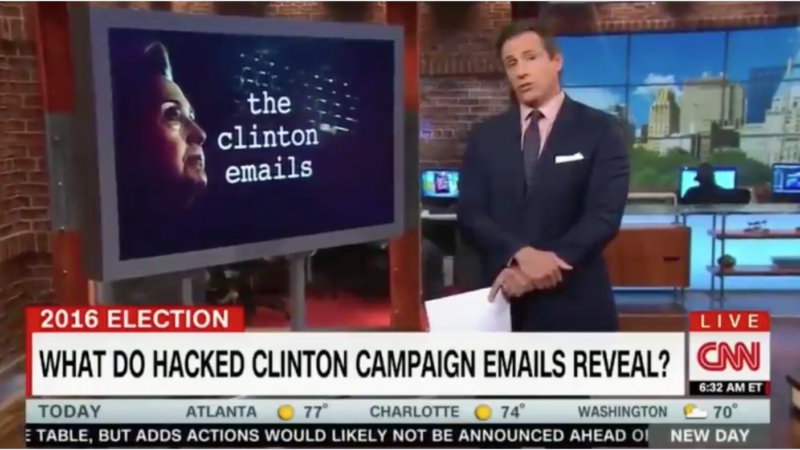 Today on CNN, news anchor Chris Cuomo claimed, “It’s illegal to possess these stolen documents. It’s different for the media. So everything you’re learning about this, you’re learning from [CNN],” before delving into a segment on the leaked emails. The statement is generating a lot of buzz on Reddit, where the video appears six times on the front page of the site. So, is it really illegal for you to access or possess the recent leaked emails via Wikileaks? Wikileaks, founded in 2006 is an organization which attempts to uncover social, political, and economic corruption by publishing or “leaking” classified or censored documents which the public does not normal have access to. Julian Assange, Wikileaks’ editor-in-chief, is currently living in asylum at the embassy of Ecuador in London. Sweden has a warrant for his arrest in a case involving allegations of sexual assault. It is uncertain whether or not the United States would attempt to prosecute Assange should he step on U.S. soil, but the United States government confirmed in December 2015 that there is an ongoing investigation against Assange and Wikileaks. What’s in the recent email leaks? The recent email leaks are from the email account of John Podesta, the Chairman of Hillary Clinton’s presidential campaign. For those interested, I urge you to read the emails for yourself and draw your own conclusions. The emails are available on Wikileaks and social media sites like Reddit and Twitter. Is it illegal to access Wikileaks? Though it is a bit of a gray area (in some cases you are reading classified information without proper clearance) you will not face legal repercussions if you access Wikileaks. You are not the one who hacked government accounts and released classified information to the public. These documents are publicly available on the internet and screenshots have been posted across multiple platforms. The Twitter feed of the official Wikileaks account (@wikileaks) if full of the leaked emails. So far, there have been zero documented arrests of citizens who access these publicly available documents on the internet. Cuomo’s phrasing implied that anyone outside of the media accessing Wikileaks data is in violation of the law and that you have to watch CNN (or a similar media broadcast) to get information on the leaks. Objective News Report rates this interpretation of Cuomo’s claim MOSTLY FALSE. However, if you were to go and hack government databases and obtain possession of the documents, that would be illegal. If we ignore the context and phrasing of Cuomo’s statement, Objective News Report would rate it TRUE. Does the “media” have special protections when dealing with leaked information? In some cases, yes they do. In Bartnicki v. Vopper 532 US 514 (2001), the United States Supreme Court relieved the defendant (a media representative) of liability for broadcasting an illegally obtained audio recording. The Supreme Court ruled that the media is not liable if the media station did not illegally obtain the tape, even if the tape was illegally obtained to begin with. Objective News Report rates Cuomo’s claim that “It’s different for the media [to access classified info such as Wikileaks],” TRUE, BUT VERY MISLEADING.